While my family was in town, we went to one of our restaurant mainstays – The Keg. Although I am an adventurous eater and come from a family that has roots in the restaurant industry, my parents are fairly conservative when it comes to food. My brother is game to try new things, but doesn’t cook. When I go out to eat with my parents we go to one of four or five restaurants that have been tried, tested, and true. They know what to order and what to expect and don’t really stray from the list. The Keg is the default “fancy” place of the list where they can get a good steak. Ironically a few years ago my dad wasn’t eating beef, I was a vegetarian and my mom was on a big seafood kick – yet we still went to The Keg! Anyway, they had a set menu special that my mom had which included the Billy Miner Pie. It’s basically a 4″ high mocha ice cream pie on a chocolate crumb crust, topped with caramel sauce and almonds. It’s generally a crowd pleaser, and yes, it’s good! A couple of friends of mine love this dessert and as I was going to see them, I decided to do my own take on the Billy Miner Pie. Their ice cream was veeeeery fluffy (almost whipped) with a mild taste. I did a normal churned ice cream amped with chocolate and espresso powder which yielded a rich, smooth, and dense product. As you can see from the picture, I didn’t get quite the height as the original but I’d sacrifice a bit of size for quality. As for the crust, it seemed that the original had chocolate crumb packed onto the bottom and side of the slice. It was powdery and didn’t have any solid support structure at all. 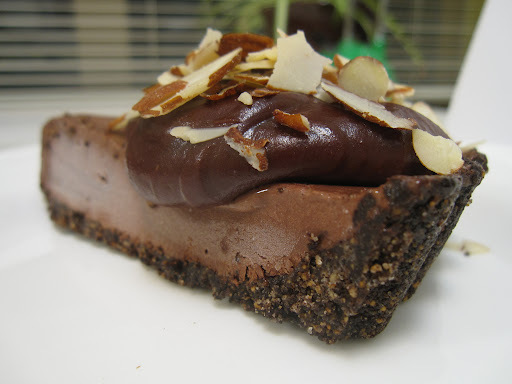 I stuck with a chocolate crust, mixing boxed crumb with ground up toasted hazelnuts with melted butter and sugar. I pressed it into a tart pan and baked it for about 15 minutes. It was definitely more like a tart crust, but the nuts in the crumb added a great dimension to the flavour. Their was a basic caramel sauce. Probably from a bottle. I made a fudge sauce of which the base was a salted caramel sauce to which I added a generous handful of dark chocolate. Yeah. It was awesome. Thick. Gloppy. Not too sweet. Same for both. I could’ve toasted mine I suppose…. All in all – I think my version was pretty darn good. But let’s all admit, we have weaknesses for things that are not quite as fussed over (mine is McCain’s Deep & Delicious Cake). ← The Sandwich of Dreams! Mmm looks delish BA! And YES McCain deep & delicious is an enternal fav of mine – how do they get it so good??? I'm totally like the nuns scarfing it down in that old commerical.